I have just set up my KeyLab Essential 61 today and hooked it up with Ableton Live Lite. I have stumbled upon a problem with the display, jog wheel and part controls. When I use the controller with the Analog Lab3 application the display, jog-wheel and part controls work just fine. However, whenever I want to use the controller to control Analog Lab as a VST in Ableton, the part control buttons do not respond at all, the display keeps showing "Analog Lab" and doesn't show any changes I try to make using the jog-wheel. They are visible on my computer screen but one of the features that made me chose this controller was the fact that I could actually see what I'm scrolling through on the controller's display itself. Please help save my workflow! Are you on the Analog Lab memory when you want to control it ? thanks for getting back to me. I am using Ableton Live Lite 9.7.5 (64-bit). I did scroll through all the possible FAQs including the one you're linking me to. I am also on Analog Lab control when I want to control. And I can control it. It is responsive. However, I can track the changes of presets only through my computer screen, KeyLab Essential's display is unresposive. It only says "Analog Lab" while no other information is shown while controlling Analog Lab itself (as a plugin). Also, part control buttons are unresposive. Everything works well in the standalone version of Analog Lab. The problem persists only while using AnalogLab as a plugin. I have come to think that it is most likely a software issue? Mayhbe something wrong with the dll file? I really dont know. 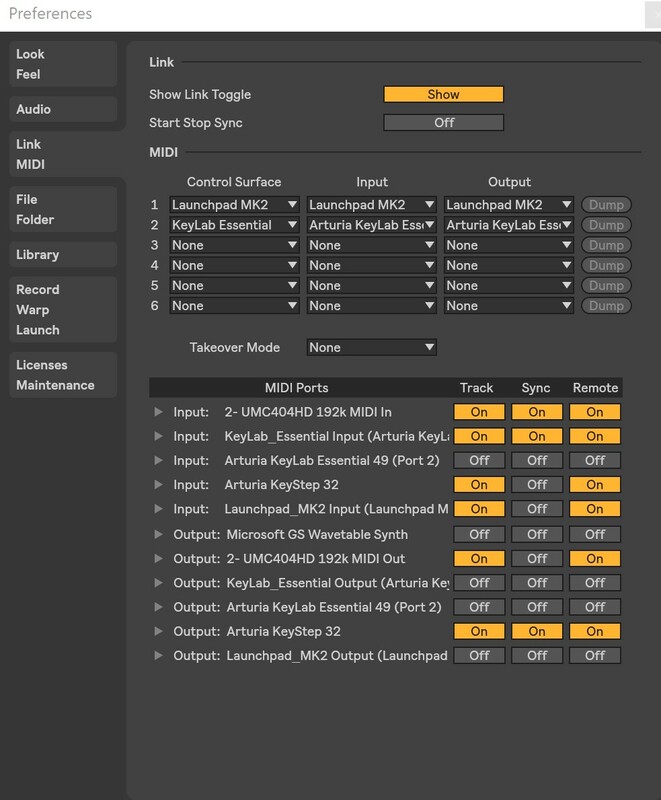 Can you show me a screenshot of the MIDI Config Preferences of your Ableton Live setup ? I think I see where the issue is. Try to uncheck both MIDI Ports Output on the "Track" column (the last two) and see if it solves the issue. SOLVED! Thank you VEEEERRYYY MUCH!! I'm having the same issue with my new Keylab 49 and it's driving me crazy. I've tried to solve it the same way as explained here but no luck. I guess must be doing something wrong.